After Hus’s martyrdom his Czech supporters, the Hussites, organized militant resistance to the Holy Roman Empire. Remarkably, the vastly outnumbered rebels repelled six crusades and even launched several offensives outside Bohemia. One of their secrets was the war wagon (above), a mobile fortress loaded with bowsmen and gunners. The wagons slammed through enemy lines, facilitated evasive maneuvers, and once, when filled with rocks and rolled down a hill, sent an attacking force into such a panic that 1,400 soldiers were flattened or killed while trying to retreat. A legend arose after Hus’s death that, in final protest against priests withholding the Communion cup from lay people, he went to the martyr’s pyre with a chalice in his hand. A chalice, sometimes a flaming chalice, became the main Hussite symbol. During World War II, European Unitarian Universalists co-opted the flaming chalice as an underground sign for their humanitarian operations. The symbol is now common in Unitarian churches, though Unitarians can claim no theological link with Hus. Hussite songs like “Oh, Ye Warriors of the Lord” united communities, lifted soldiers’ spirits, and proclaimed reforming beliefs. 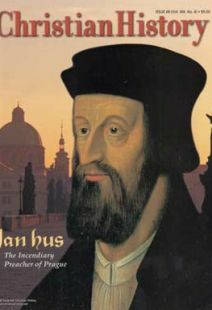 The Bohemian Brethren (later known as the Moravian Brethren or Unitas Fratrum), which grew from a moderate Hussite wing, continued the tradition, becoming the first Protestant group in Europe to publish a hymnbook. To reach a wider audience, they published editions in Czech, German, and Polish. “It has been our chief aim,” they said, “to let everyone fully and clearly understand what our views are with regard to the articles of the Christian faith.” The audience eventually included John Wesley, who was amazed by Moravians he met on his way to North America. They sang while their ship was tossed by a storm, and his desire to know their faith led him toward his dramatic conversion at Aldersgate.